Awesome rate for your Barbados vacation on a quiet residential area, steps away from Historic Holetown on the West Coast. Within a 4-5 minute walk to the coral sandy beach, the tranquil Caribbean Sea. FYI: Why not consider the month of April, with our great low rate. No sewage problem and no seaweed on the West coast. Located between three fantastic golf courses and plenty of shops for Duty Free shopping, restaurants and nightly entertainment, in Holetown. Far beyond the sun-splashed beaches, the island delivers a warm hospitality and sensual pleasures. A home away from home, comfort at a great price. 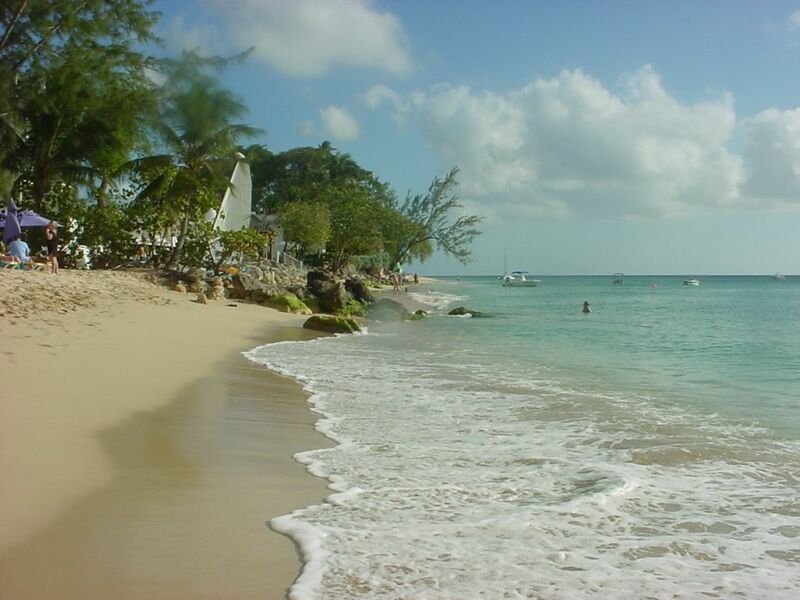 We would love to have you vacation here, and discover beautiful Barbados. One bedroom, Living/Dining room , Kitchen & Deck (garden view). Comfortable accommodations for one or two persons, or a mature couple (not suitable for children). The bedroom is spacious (with a cathedral ceiling), bright, airy, with air conditioner & ceiling fan. Two twin beds or combine them into one king size bed. Included once a week, bed linens and bath & hand towels. Laundry facility once a week, shared with owner (guest pays for own laundry detergent, etc..). Kitchen basically equipped, living/dining room seats four (4) and the deck seats four (4). Vacationed in Barbados and fell in love with the island and the people. Purchased the land and built the villa. Best of all, the property is close to everything, especially the Caribbean Sea. My wife & I have been landlords for 20+ years, and have met some wonderful people. The villa is located in a quiet sub-division, Jamestown Park, with great neighbours and away from the noisy main highway. Close to almost everything, the sea (4-5 min. walk), shopping (duty free), supermarket, local buses, library, banks, restaurants, and gas (petroleum) station. No car is necessary. Quiet neighbourhood for rest & relaxation. My wife & I enjoy the wrap-around front patio and shaded back patio to enjoy outdoor living. Our guests enjoy the shaded private deck overlooking the garden. Two separate and private units (apartments), great for landlord & guests. toilet, Pedestal sink, mirror and toilet. toilet, shower, Vanity with sink, mirror, toilet and shower. Full bathroom with a vanity sink, mirror, toilet and shower. Half bathroom with a pedestal sink, mirror and toilet. At Discovery Bay & Settlers Beach; 4-5 minute walk from villa apartment. Tranquil Caribbean Sea (West Coast). Holetown, parish of St. James on the West Coast, Caribbean Sea. Check with owners for access to landline telephone, for local calls. Collect calls only for overseas calls. Most guests now have their own cell phones. Bedroom only, with a ceiling fan. Ceiling fan in kitchen, & living/dining rooms only. Bed linens changed once a week. Laundry facility available once a week, shared with owner, (guest supplies own laundry detergent, etc..). No clothes dryer, clothesline to dry the clothes by the sun, which is plentiful. Parking available on property, should you wish to rent a vehicle. Bath & hand towels provided once a week, additional towels available upon request. Beach towels available upon request (deposit of $20.00 Barbados). Seating for 4 or enjoy the table & 2 chairs on the shady deck. Electric stove (four coil burners) with bottom oven. Electric stove with bottom oven. Kitchen equipped with the basic needs; electric stove with oven, refrigerator with top freezer, microwave, coffee maker, & toaster. Dining table, seating for four, or enjoy sitting out on the deck. Cable television. Cinema in walking distance at Limegrove Lifestyle Centre. Books available, take one, and leave one for other guests. Garden view, with swaying coconut palms. Shady deck with view of the garden, with swaying coconut palms. Seats 4, with a coffee table to enjoy a glass of wine, Banks beer or a cup of tea. Table with 2 chairs on deck to enjoy a meal. Three golf courses within a short drive. Sandy Lane golf course and Westmoreland golf course. Ideal for one or two people, to enjoy the island and/or for rest & relaxation. Plenty of restaurants/bars, supermarket, nightly entertainment, and cinema all within walking distance. Plenty to see and do to discover the beauty of the island. All windows are screen meshed to keep out those nasty mosquito's during dusk & dawn. The villa is in a safe neighborhood, for added security, all windows fitted with security bars and doors equipped with dead lock and sliding bolts. We have a/c in the bedroom, and appreciate the a/c be turned off when going out for the evening. Also, have the windows closed when using the a/c. Accidental breakage, we appreciate that item(s) be replaced, on your own. Owners do not accept responsibility for losses or accidental injury. Property owners live next door from Nov. to Apr., should you have questions during your stay that need to be addressed, especially for our first time visitors to Barbados. Enjoy Barbados, your tropical holiday vacation. The hosts, Paul and Stasia, made our stay very good. They were always available if their was any questions. We enjoy reading the paper and each day Paul would bring one over to us. The location was great, close to everything with only a five minute walk to the beach and not much further to the shops and restaurants. If you are staying here try the One Love Cafe for lunch and Sunday night karoke. A true Bajan spot. An added bonus was having the housekeeping done once a week including our laundry. We appreciated that. Thank you for your kind words and the jar of honey. Hope you return to sunny Barbados real soon and our Awesome Villa Apartment. It was as described on the internet. Great love holetown accommodation close to shops restaurants and beach. David; thank you for your comments, please return real soon. All the best. Did not like to leave this great rental with its outstanding hosts. Just a wonderful location in Holetown where everything is a short walk. The apartment was clean and well equipped and even occasionally gave us some views of the islands green monkeys! Thank you for your response. We too feel the location of our rental apartment is in a wonderful location in Holetown, and just a 4-5 minute walk to the coral sandy beach. Glad you enjoyed your vacation in Barbados, hope you come back real soon. All the best. Quaint villa with all that is required for your stay on the island. Set in a quiet area with a 5 minute walk to the beach and supermarket. A well maintained property.Paul our host couldn't have been more helpful and pleasant. With only a 2 Bajan dollar (80p) bus fare it was a central place to visit other parts of Barbados. People on the island were friendly and extremely helpful. Eating out, you can make it as expensive or as cheap as you like. would definitely stay in the same accommodation again. Thank you for your review, pleased to hear you liked the accommodations, and you enjoyed your vacation in Barbados. Loved having you, and please come back real soon to our island in the sun. Four to five minute walk to the sandy coral beach. Enjoy the boardwalk along the beach, and a variety of watersports. No car is necessary. Explore this enchanted island on your own with the service of island-wide local buses (fare US $2.00 / Bds. $3.50), or negotiate with a taxi driver for a personal tour, or book one of the many island bus tours. Historic Holetown offers plenty of restaurants/bars with nightly entertainment to explore and much, much more. Shopping galore with two malls, the West Coast Mall with a supermarket & Duty Free shops; the Limegrove Lifestyle Center (see pictures) with designer shops, restaurants and two cinemas. Also, the Chattel Village just beyond the mall, with Duty Free shops, outdoor Cafe Carizma and The Gourmet Shop (for specialty items & wine). Superb Golf courses; Sandy Lane, Royal Westmoreland, Apes Hill, Rockley or the Barbados Golf course. Tennis, Sailing, Scuba diving, Snorkeling, Para-sailing, and Wind surfing (South-east coast), or just relax and enjoy the sun, sea and sand. Shopping (duty-free) in Holetown and Bridgetown, the capital with a 20 minute bus ride away. Things to see and do: Horseback riding, Mount Gay rum, & St. Nicholas Abbey tours, visit Harrison Caves, Bathsheba (East coast), North Point, Cherry Hill, St. Lawrence Gap, Pottery factories, Crane Beach, Flower garden (monkeys), Museum, Swim with turtles, dive to a ship wreck, Submarine tour, and/or sail on the famous Jolly Roger pirate ship. Please note: 1. Prices may change without notice due to the market value of the US dollar. 2. We, the owners, do not accept responsibility for losses or accidental injury, or loss of life however caused.